Kalimpong is a small hill station between Siliguri and Gangtok in Darjeeling district of the West Bengal state. This is situated at an altitude of about 1250 meters above sea level between the Durpin and the Deolo Hill. It is famous round the globe for beckoning Himalayas, dense virgin forests, green meadows and undulating valleys. Scores of tourists from several parts of the globe come here to enjoy pleasurable holiday amidst serene and scenic natural ambiances. The peaceful ambience of this place is heightened by the presence of monasteries and churches across the town. Until the 18th century AD Kalimpong was a part of the Kingdom of Sikkim which was ruled by Sikkimese rulers. It was then taken over by the Bhutanese. But in the 19th century the British took over Kalimpong and merged into the present Indian state of West Bengal. It is the oldest and most famous Bhutanese Monastery of this place which was established in 1692. 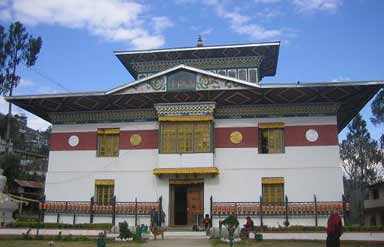 This Gompa was built under the Bhutanese rule under the direct guidance of Bhutan King. The preserved religious and cultural legacy of this summons place call on scores of tourists every year. Every day the monks offer prayers twice, once in the morning and once in the evening and the prayers are accompanied by the blowing of conch shells and long trumpets and beating of the drums. During festive occasion the masked dance ceremony is performed which is attended by large number of tourists. This is among the most popular attractions of this place which was built in 1937. It is the monastery of the Gelukpa sect (Yellow Hat) of Tibetan Buddhism which is belongs to the sect to which the present Dalai Lama belongs. This is situated atop Tirpai Hill in beautiful serene and scenic natural ambiances. The Gompa contains idols of the Bhaisajya, Sakyamuni and Maitreya Buddhas (past/present and future form of Buddha). The tiny hall inside the monastery decorated with images of flayed animals and humans is the foremost attractions of this monastery which gives deep insight on the life and teaching of Buddha. The Gompa is surrounded by picturesque and lush green dense forests through which one can view the scenic Himalayan ranges. 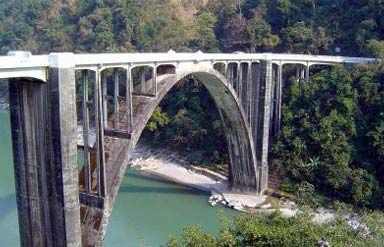 This is 120 feet high ropeway located over the famous rivers Teesta and Relli. To enjoy the thrilling experience of this adventure ride tourists flock in large number round the year. 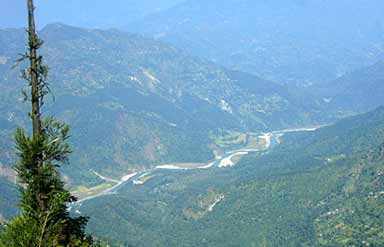 Tourists can have spectacular view of the river under the ropeway and the lush green surrounding. The view is so fascinating that it will remain unforgettable experience for any travelers. It is the prominent attractions of this place which is visited by scores of tourists who come here from several parts of the globe. This spectacular hill town is an important flower producing center of India. Some of the other exotic flowers that cultivated here are amaryllis, lilies, anthuriums, roses, gerbera, dahlias and cacti. There are numbers of nurseries located here which is thronged by scores of tourists to enjoy the scattered scenic beauty of blooming buds. It is a shopper's paradise and the main market in Kalimpong where tourists come to purchase craft, handicraft items and artifacts made by local craftsmen. With the exotic collection this market is also known for its scenic location which never fails to enthrall tourists during their visit to this place. By Air: The nearest airport is Bagdogra near Siliguri, which is at a distance of 79 km from Kalimpong. This airport is connected to Kolkata, Delhi and Guwahati. International travelers can get connecting flights from Kolkata or Delhi. Both cities are well-connected with many cities in India and abroad. By Bus: The Kalimpong city is well-connected to other cities in Sikkim and the neighboring states by bus services. By Rail: The closest railhead for reaching Kalimpong is at New Jalpaiguri, which is around 77 km away. Located on the outskirts of Siliguri, the station is connected with almost all major cities of India. The best time to visit Kalimpong is between March and mid-June or from September to December.